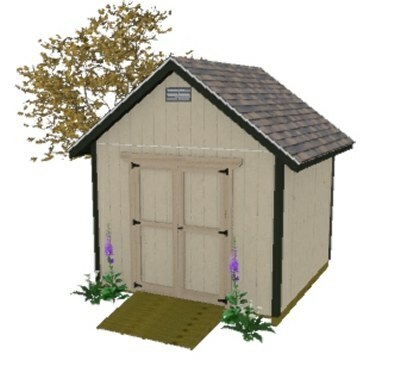 There are several types of shed siding you can use when building your shed. Before you actually begin construction, you should decide on the type of you want to use. If possible, you should try to match the siding on your home. If you are going to use a lap siding of some sort like vinyl or wood you will first need to put on a layer of wall board for structural strength like 1/2" OSB (oriented strand board). Most types of vertical paneling that come in 4'x8' sheets do not need anything else added for structural wall strength. My favorite of all vertical shed siding is LP smartside siding panels. They are readily available at your big box lumber store like lowes or home depot. These 4'x8' panels are engineered and pre-primed panels. They come in 7/16" and 19/32" thicknesses. 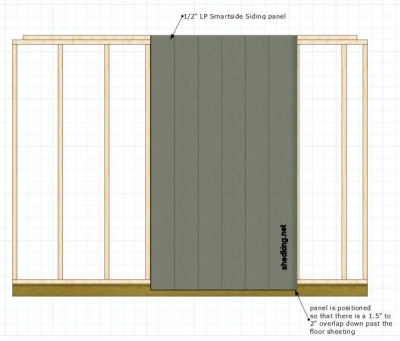 If you plan on using the 7/16" smartiside panels, your wall framing must be 16" on center. Here's a link to the LP website to learn more about their fantastic siding. To this day I have built, as an example, chicken coops using the exterior smartside siding panels and have not painted them. (I know, shame on me) This was 8 years ago, and the coop is still around and housing chickens. The panels are still in good shape! Smartside siding panels are 7/16" and 19/32" in thickness and are very strong structurally. They are easy to cut, easy to work with, and look good too! Just paint them with your favorite color of exterior paint and you are good to go. As I mentioned before, they are already pre-primed and ready for you to paint. The use of these panels does not require you to first put on any type of wall sheathing for strength, however with the 7/16" thick panels, you must do your wall framing at 16" on centers. Here's an example below of a 10x10 gable shed with these panels. The color you see here is the standard color these panels come primed with. Another common type of vertical shed siding is T1-11 exterior siding. Its use does not require wall sheathing and will add structural strength to your shed walls. T1-11 comes in 4'x8' panels and has channels running vertically about every 8". T1-11 panels do not come pre-primed and the texture is somewhat on the rough side. Just like LP smartside panels, they are easy to work with and if primed and painted properly they too will last a long time. 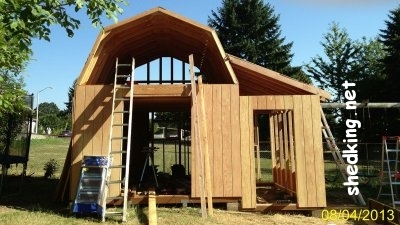 These panels also come in 4'x8' sizes and are perfect for easily siding your shed. As you can see in the example pic above, siding is started in the middle of the door opening. This way when you cut the panels out, you will have two equal sizes for building your double shed doors with.